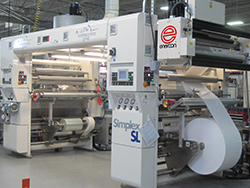 Printers and converters who integrate solventless laminating enjoy a competitive advantage by offering their customers a single source for flexible packaging. Thanks to recent advancements in laminating process technology, adhesive chemistry and equipment design, implementing a solventless laminating operation has never been easier. However, it’s important that operators understand the basic principles and variables of the process to maximize production and reduce waste. Join our panel of application experts from Nordmeccanica Group, Dow Chemical Company, and Enercon Industries for an educational webinar on the best practices for successful solventless laminating. You’ll receive application insights on films, adhesives, equipment, and processes to ensure your operation’s success. Reserve your spot today for this informative webinar. If you can’t attend the live event, be sure to register today so you will receive access to the webinar when it is available online. Which time frame best describes your next surface treater investment? Would you like someone from Enercon to contact you?